We discuss the strengths, weakness, and potential applications of each, below. 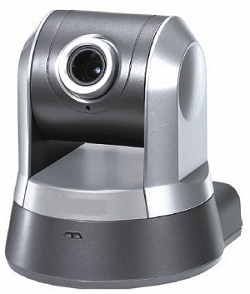 The main advantage of mini PTZ cameras is cost. 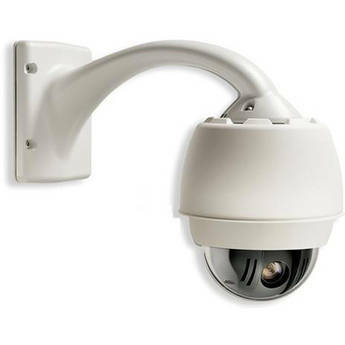 Since many lower-cost manufacturers, especially in the SOHO/SMB markets, only offer this style of PTZ, they are typically among the lowest-cost movable cameras available. Some may be found online for as low as $200 USD. PTZ range: Most mini PTZs do not have a full 360º pan range, instead limited to about 340º or under. Tilt may also be limited, with some cameras unable to tilt a full 90º, meaning they are unable to see what is directly beneath the camera. E-flip functions are also rarely available, which may make tracking moving subjects difficult. PTZ speed: Mini PTZs also typically feature slow panning speeds, often below 90º per second, when compared with speeddomes (300-400º/sec not uncommon). Tracking moving subjects with speeds this slow may prove difficult. Zoom range: Zoom range is typically limited to 18x or lower. Some manufacturers have begun releasing PTZs with no optical zoom at all, using a fixed focal length lens instead. When using megapixel resolutions in small areas, this may be usable, but digital zoom with VGA cameras is far less practical. Indoor only: Due to their construction, most mini PTZ cameras may not be directly located outside. Some may have outdoor housings available, but this adds additional cost, and is less simple than mounting a unitized speeddome. This grade of camera is only recommended for home or small office use, as they lack features which most commercial users would expect, most notably PTZ speed. Pre-packaged: Due to their construction, speeddomes typically require less work to mount, and may be mounted in a variety of locations. Wall, pendant, recessed ceiling, and other mounts are all readily available. Fast PTZ speeds: Speeddomes are the fastest movable cameras available. Speeds over 300º per second are not uncommon, and over 400º per second is not unheard of. This allows tracking of faster-moving subjects, and shorter movement times when switching between presets, often a fraction of a second. Pan/tilt range: Speeddomes typically feature full 360º pan range, without stops, and 180º tilt range with e-flip, to allow trailing of subjects as they move beneath the camera. Recent cameras have extended tilt beyond 90º, with some offering up to 15º of up-tilt, above the horizon. Up-tilt previously required a pan/tilt positioner. Less wind loading: Compared to pan/tilt positioning systems, reviewed below, speeddomes do not have as many issues in strong winds, which may cause vibration in pan/tilt cameras. Cost: Speeddomes are more expensive than PTZ cameras, often by 5-6x, which may make them cost-prohibitive in some applications. Pricing is typically well below pan/tilt positioning systems, however. Zoom range: The highest zoom range available in speeddomes is about 36x, or lower among megapixel PTZs. Also, lenses typically may not be changed, requiring an all-new camera be installed. For those seeking extremely long-range imaging, pan/tilt systems should be considered. Speeddomes are the most commonly deployed movable cameras, due to their increased speed and mounting options. These factors contribute to their use in many verticals, though casinos, municipal surveillance, healthcare, and corporate security are likely most common. Due to their increased price, SOHO and small business are unlikely to select them. The key advantage to pan/tilt positioners is flexibility. 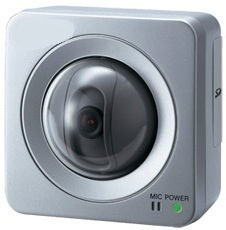 Users may choose from multiple cameras and zoom lenses, instead of being limited to available speeddome options. This is useful when extremely long-range zoom lenses are required, as megapixel lenses up to 60x are now available. IP integration issues: Very few IP cameras are available with R2-422/485 outputs used to control pan/tilt motors. This limits users to using analog cameras with encoders, or choosing from the few IP options available, such as the Axis Q1755 and Bosch DinionHD. 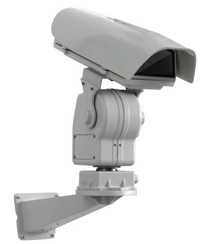 PTZ speed: Positioners often have low pan/tilt speeds, due to the weight and balance of cameras mounted on them. Increasing speeds could lead to increased vibration and "bounce" as cameras started and stopped moving, making tracking more difficult. Wind loading: Due to their increased profile, positioning systems in exposed areas may suffer from vibration due to wind, which is reduced or not present when using speeddomes. Positioning systems most often see use in critical infrastructure, shipping ports, and military applications, where long-range zoom is required.